© 2011-2013 MJ Henry & Associates. All rights reserved. MJ Henry & Associates specializes in education and consultation services for individuals and organizations working to support children, youth and families, especially those who have experienced adversity. Led by Martha J. Henry, PhD, a Clark University trained developmental psychologist, we provide professional education and program evaluation in the areas of child welfare, foster care, adoption, and child and family behavioral health for organizations and public agencies of all sizes. Dr. Henry brings over 20 years of experience working with and studying children and families, and her passion for translating evidence-based knowledge to everyday practice and policy development. She is the lead author of the book Adoption in The United States: A Reference for Families, Professionals, and Students, and has been a sought after expert for national media programs such as NBC’s The Today Show, Time Magazine, and New York Public Radio, where she consistently stresses the critical importance of informed decision making. MJ Henry & Associates serves professionals from all disciplines who transform the lives of children, families, and communities. From our unique medical education services that provide health care practitioners with pertinent knowledge and skills to support patients' family-building and decision-making needs to evidence-grounded and practice-based offerings for human service professionals, we are dedicated to translating the latest research to everyday practice approaches and informing researchers of the practice challenges faced by multiple child and family serving disciplines. It is our mission to offer practical solutions to the challenges faced by professionals at all levels of child and family serving systems. Learn more about how we can help you enhance your practice with children and families. We translate the latest research findings to the everyday practice of supporting children and families. Email us or call us at (508) 641-1647. We can help. Email or call (508) 641-1647. 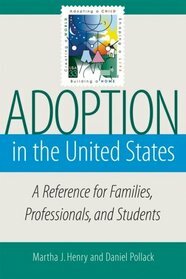 This book contains answers to almost all the questions we are asked by prospective adoptive families...This is a book we will refer to often, and is an excellent resource for anyone seeking the unbiased facts about adoption.